Although Chael Sonnen (Pictured) had plenty of opportunities to respond to Anderson Silva’s verbal assault during Monday’s epic conference call, the most articulate smack talker in mixed martial arts opted to stay relatively mum – much to the utter shock of every media member who was also on the phone. After stewing over Silva’s threats for 24 hours, Sonnen came storming back on FUEL TV’s UFC Tonight. 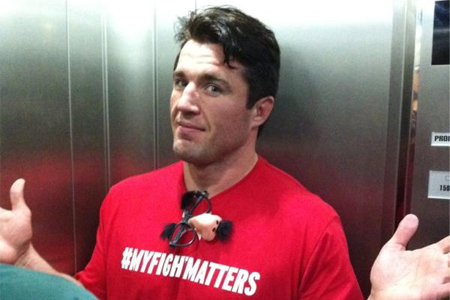 It was a far cry from the classic Uncle Chael banter, but perhaps he’s saving his best material for UFC 148 fight week. “Well, it was nice to see the real Anderson come through,” Sonnen stated. “The guy is a dirt bag, like I’ve told you for years. He made a lot of statements about breaking my teeth and bones, but it’s not like I’ve never been to the orthodontists before or had my jaw stapled. Thankfully for all involved, and those entertained from afar, the time for talking is nearly over. The most anticipated rematch in the sport’s history takes place July 7th inside MGM Grand Garden Arena in Las Vegas, Nevada. Sonnen came within just 110 ticks on the clock from dethroning “The Spider” in their initial meeting at UFC 117 in August 2010.